The European offshore wind market is visibly booming; the coast lines of the United Kingdom, Denmark and Germany are being transformed into profitable green energy sources. 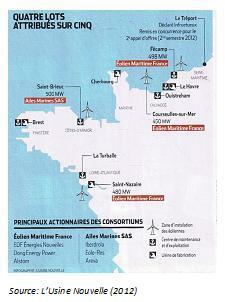 This high potential sector was until now of low importance for France, despite its 3.500 km coastline the country does not have any operational offshore wind parks. With the publication of the first tender in April 2012 of almost 2GW also France took the step to increase its offshore sustainable energy production. In this context, Transfer Consultancy organized a trade mission for the offshore wind sector to France, at the request of the Ministry of Economic Affairs of the Netherlands and in cooperation with Cleantech (the Dutch export organization for sustainable technology) . The mission took place from the 1st to the 4th of October 2012 in 3 different French regions: Ile de France, Pays de la Loire and Normandy. 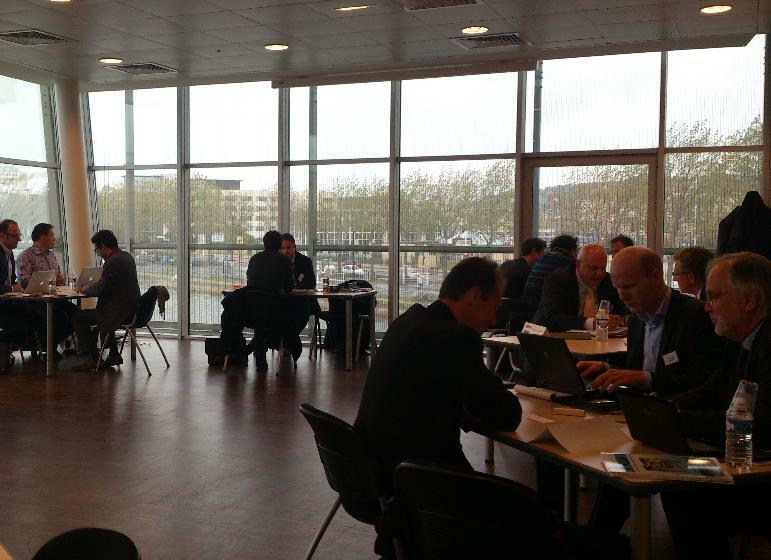 A delegation of Dutch companies travelled to France to meet the winning consortia partners: Eolien Maritime France (EDF/Alstom) and Ailes Marines SAS (Iberdrola/Areva/Technip) as well as the local French actors. In total these consortia have won 4 different offshore wind projects on the west coast of France during the first tender (see image). The Transfer team and the Dutch participants started the mission with an informal briefing and a typical French dinner during which Gerald Baal, Director of Transfer Consultancy, described the ins and outs of the programme as well as the typical characteristics of the French business culture. On the first day of the mission the delegation had the privilege to be invited at the Residence of the Dutch Ambassador Ed Kronenburg, to meet the consortia partners. After an explanation about the developments in the French offshore wind sector by Nicolas Serrie, the Project Manager from Alstom and the Purchase Manager of EDF, Mrs Richard, the participants were enthusiastically received by several managers from EDF and Alstom for individual meetings. Following an informal lunch and a good glass of wine with the French contacts, the second consortium Ailes Marines was received at the Residence. The managers of Areva, Iberdrola and Technip gave an interesting presentation in which they highlighted different aspects of their offshore wind project in Saint-Brieuc, Brittany. During the cocktail at the end of the day, there was time to discuss the business opportunities with the French counterparts. It was a rewarding day for the Dutch and French participants who had the chance to get into direct contact with potential partners and to discover points of mutual interest. The rest of the week was dedicated to the exploration of the regions around Le Havre and Saint-Nazaire in order to discover the coast areas where the future offshore wind parks will be realized. With the collaboration of the local institutions being Ouest Atlantique (Saint-Nazaire) and Le Havre Développement (Normandy), B2B meetings and group visits were organized in these regions. After a field trip to the harbor of Le Havre where the future assembly and fabrication plants of Areva will be built, the afternoon was fully booked with B2B meetings between the local companies and the Dutch delegation. Well known names in the sector such as La compagnie du vent, Eiffage, EMCC and Saipem had the chance to meet several Dutch companies and to exchange their savoir-faire. The business meetings continued in an informal setting during a cocktail at the Chamber of Commerce. After this successful day in Le Havre, the trip proceeded to Saint-Nazaire where the last day of the mission was entirely focused on the discovery of this dynamic region and the local offshore developments. 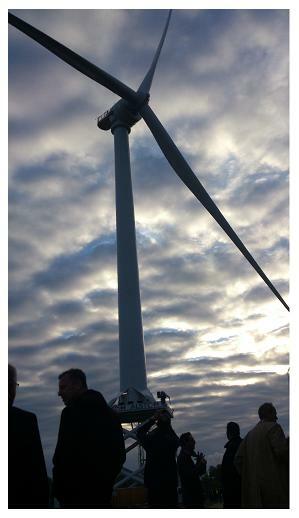 The next day at dawn the entire delegation had the chance to experience the functioning of the impressive prototype windmill of Alstom, followed by a guided tour in the harbor of Saint-Nazaire. This productive morning ended with a company presentation at the headquarters of STX France. Also in Saint-Nazaire many French companies responded with enthusiasm to the opportunity to get in touch with foreign suppliers. During a lunch buffet and subsequently during the matchmaking meetings, possibilities for cooperation were discussed. Important players such as STX, DCNS, Eiffel and Bureau Veritas evaluated the meetings as very positive. After an intensive week we can look back on a very successful trade mission. The consortia are aware of the efforts which are required to reach the objective set by the French government to build 1.200 windmills for 2020 with a total capacity of 6.000 MW. The country has proven to have the required skills in the onshore wind sector, with its 4th place in Europe for onshore wind energy production. However, the offshore wind sector needs to be developed in order to achieve goals. This includes the realization of the attributed as well as the upcoming projects, such as the new tender representing 1305 MW which will be published before the end of 2012 (Source: L’Usine Nouvelle). Since the offshore wind market is still in a start up phase, French SMEs need to acquire competencies and create a high-performance industrial sector to assure the success of the planned projects. This development offers opportunities for French and foreign companies, which can respond to the existing energy needs by their expertise in different fields of the construction and exploitation of the offshore wind parks. This trade mission showed that there are plenty of chances for foreign companies which are willing to invest in local partnerships with the French SMEs in order to transmit knowledge and skills to stimulate the growth in the French market. In total, not less than 31 French companies participated to the trade mission, among which 17 in Le Havre and 14 in Saint-Nazaire. ‘I am delighted by these BtoB exchanges with the Dutch companies; the selection was very interesting for our activity of Marine Renewable Energy at STX France. Are you also interested to seize these promising opportunities? Do not hesitate to contact us!